Play with your friends anytime, anywhere. Recruit backup or join another Ghost's game and you'll maintain all your mission and character progression. When playing solo, you'll always have a team of 3 Ghosts providing you with backup. Give them orders and they'll help you accomplish your missions in whichever way you choose. Explore, through 50 cameras, the Bolivia of Ghost Recon Wildlands. the country has fallen into the hands of Santa Blanca drug cartel who aims to create the biggest Narco-State in history. Your Ghost and his equipments will be fully customizable. Military uniform or Bolivian style, silenced sniper rifle or machinegun, the choice is up to you! All firearms in the game are fully customizable, allowing you to swap out attachments to tweak various attributes of your weaponry. Swap out optics, muzzles, magazines, stocks, and much more, all of which will affect the performance of your weapon. Customize the appearance of your weapons with camouflage and paint options, giving you even more control over your operative’s style. When creating your character, you’ll have the ability to customize your gender, facial features, hairstyle, tattoos, and much more, and you’ll gain access to wide range of clothing, tactical gear, and accessories to give your Ghost a personalized look. You can hunt down the cartel in full tactical gear or use civilian clothing if you prefer the style of the Bolivian locals. With the ability to tweak every piece of your outfit, and billions of available combinations, how you look is up to you. Ghosts are not just a standard military unit. They are the 4 best Special Forces Veterans, deployed behind enemy lines to prevent conflicts before they happen. Individually, they are great. Together, they are unbeatable. They don't follow strict orders, but decide for themselves how they'll take on each mission with only their gear, their comrades, and their wits. No matter how, they get the job done. The unit is legendary, but their actions are anonymous. 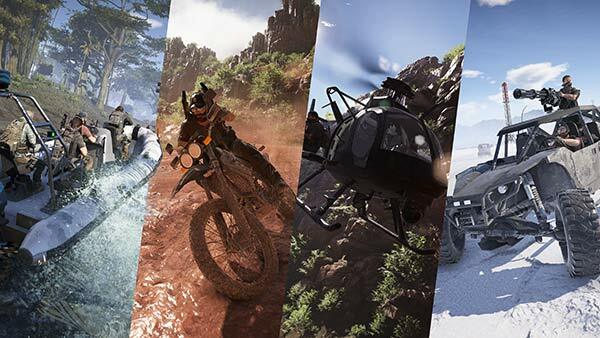 The Santa Blanca Cartel has roots all across the Bolivian landscape, and your squad will need to choose how to traverse the country’s winding roads and off-road terrain. Find rare vehicles such as Supercars and military-grade transports to aid in your mission against the cartel. Production focuses on each and every step seaparating a coca leaf from its white powdery counterpart. Its main infrastructures include coca fields, farms, laboratories and hideouts spread out across the Wildlands. Rudolfo Yana, also know as El Yayo is an ex-cocalero turned cocaine producer and the Santa Blanca's highest ranking Bolivian. Formerly a coca union leader and major drug producer in Bolivia, he organized the cocaleros into a medium-level cocaine production operation. He only agreed to work for the Cartel after they threatened his family. The Trafficking operation controls the packing and transporting of the Santa Blanca's final product within Bolivia and internationally. Their main infrastructures include processing plants, shipping stations, railways and airports. Nidia lived through a violent and traumatic childhood. She became a Beauty Queen at 18 and started dating narcos, using them to rise through the organization. She uses her beauty and her wit to make sure the Santa Blanca’s product is delivered safely. El Sueño left his village at 11 to become a sicario, telling people he wouldn’t come back until he became king. He is rumored to have spoken to Santa Muerte in an awakening. While his tattoos seem to attest to his faith, it is unclear whether he is a true believer or master manipulator. Brutal and religious, he’s a brilliant leader. El Sueño instills loyalty in those he meets and fear in those who oppose him. Brutal and religious, he’s a brilliant leader. Insightful, reflective, El Sueño instills loyalty in those he meets and fear in those who oppose him. The Influence operation takes care of the Santa Blanca cartel's recruitment and public image. They use religion and education to influence civilans. Its main infrastructures include churches, monasteries and sanctuaries. El Cardenal was excommunicated by the Catholic Church for preaching forbidden cults. This caused him to lose everything, until the Santa Blanca cartel gave his life new meaning. El Sueño invited him to join the cartel, give sermons in Santa Blanca churches, and manage the public image of the organization. The Security Operation and the men and women that compose it are the ones who make sure that every division of the Cartel can operate safely, protecting the cartel's infrastrucutre as well as the member's villages and places of work. Operating in collaboration with every other operation, you will find also find them in outposts, camps and road check points. El Muro is Head of Security and the personal bodyguard to El Sueño, he is "the wall between him and his enemies, between him and Death".